How are you doing with the record snow and rain across the country? We have been enjoying cross country skiing and appreciating California newts while walking in the rain. The Senate is holding a PFAS hearing at 10AM EDT March 28, 2019. I also met with Consumer Product Safety Commissioners to share the science and policy of flame retardants and discuss the organohalogen petition. They were interested to learn that the EU has followed their lead, as 24 member states of the European Union voted to prohibit the use of halogenated flame retardants in TVs and computer cases and stands. The other big news from Europe is that the Danish Coop is banning the sale of cosmetics and personal care products containing any PFAS. We are encouraged that the class concept is catching on in the EU.And in New Jersey, a major enforcement action is requiring five chemical producers to pay millions for clean-up of PFAS contamination. The companies will also have to disclose information about their manufacture, use, and disposal of the chemicals. We hope you enjoy the interesting news items from our staff below. Please let us know if there is a topic you would like us to discuss another month. Joe’s dog Jackson doesn’t know that he may be exposed to something scarier than the vacuum cleaner. Public health officials, scientists, and aspiring parents have watched with alarm as men’s sperm quality has declined 50% over the last 80 years. The fact that a similar decrease has been observed in the sperm of dogs suggests that a common factor may be causing this Joe’s dog Jackson doesn’t know that he may be exposed to something scarier than the vacuum cleaner. Toxic chemicals are a likely suspect. A recent study investigated the impact of two chemicals on the motility and DNA integrity of human and dog sperm. Millions of tons of a phthalate called DEHP are used to strengthen plastics each year, but this compound was found to decrease sperm quality. The same was true of a polychlorinated biphenyl called PCB-153. Though PCBs have been banned for 40 years, their extreme persistence means that we are still exposed. The results showed that while exposure to either chemical harmed sperm quality via a predictable dose-response relationship, a mixture of the two chemicals produced more complex patterns of damage, suggesting that the interaction of chemicals in a realistic “cocktail” can produce a whole greater than the sum of its parts. This month, Denmark’s largest consumer goods retailer, the Danish Coop, announced their decision to stop selling cosmetics that contain PFAS by September 2019 (see their press release). Many cosmetics and personal care products, including waterproof mascara, some brands of foundation, eye liner, sunscreen, hair spray and shampoo, contain PFAS. Recent research found that almost a third of cosmetics studied contained fluorinated substances. Since two-thirds of products were PFAS free, it should be possible to remove most PFAS from cosmetics. In May 2015, the Danish Coop made a similar decision to stop selling microwave popcorn with packaging containing fluorinated compounds. At the time, all microwave popcorn packaging contained PFAS, so their popcorn shelves sat bare for months. In October 2015, a PFAS-free popcorn bag was developed, and Danes were then able to buy a healthier movie night snack. I am one of those rare people who actually enjoys going to the dentist. I have a great dentist and love having good oral hygiene, which includes daily flossing. Imagine my disappointment to learn that the dental floss I enjoy so much, Glide Oral B, contains PFAS, harmful chemicals associated with a variety of health problems. A recent study found that women who flossed with Oral-B Glide tended to have higher levels of one type of PFAS in their body compared with those who didn’t. I also learned the reason Glide, well, glides so nicely is that it is manufactured with these Teflon-like compounds. PFAS isn’t just in dental floss; it’s in many of the products we use every day, such as non-stick pans, some cosmetics, food packaging, carpets, furniture and outdoor gear. However, the good news is I don’t have to stop my beloved flossing regimen. Most other dental flosses are PFAS-free and there are stringless alternatives, such as water flossers. How many eons will it take for PFAS to return to dust? Early this month, I, along with hundreds of millions of Christians around the world, observed the beginning of Lent on Ash Wednesday. As our foreheads were marked with ashes we were admonished, “Remember that you aredust, and unto dust you shall return.” It struck me that, because of PFAS chemicals in my body, those words aren’t true for the first time in history. These highly fluorinated chemicals, present in the tissues of nearly every person on earth, are so persistent that they will be around long after the rest of me is dust. My penchant for infusing spirituality into my work occasionally elicits eye-rolls from my fellow scientists. Nonetheless, I question if immortality is an aspiration that the chemical would better leave for the metaphysical. Fear not: my concern definitely remains with the SIN List and not lists of sins; yet, when our chemical footprints are toxic and last for geologic timescales, I have to wonder how well we’re caring for creation. A growing body of research shows that obesity can be caused by more than an unhealthy diet and a sedentary lifestyle. Studies find that endocrine disrupting compounds, such as brominated flame retardants, can lead to obesity. A 2018 study by researchers at Hong Kong Baptist University showed that PBDE flame retardants might help make that rump a little rounder than it ought to be. The researchers found that these chemicals can promote adipocyte differentiation (development of fat cells) in mice. Excessive fat deposition is associated with obesity and related diseases including heart disease and type II diabetes. PBDEs were banned by the Stockholm Convention in 2009 as persistent organic pollutants. However, their widespread use has left large stocks of PBDEs in consumer products such as furniture, which will continue to release PBDEs into the environment for years to come. Exposure to persistent legacy flame retardants shows that it takes a long time after toxic chemicals are restricted to eliminate their harm. It is better to reduce the use of toxics that to try to contain them once they are out in the world. 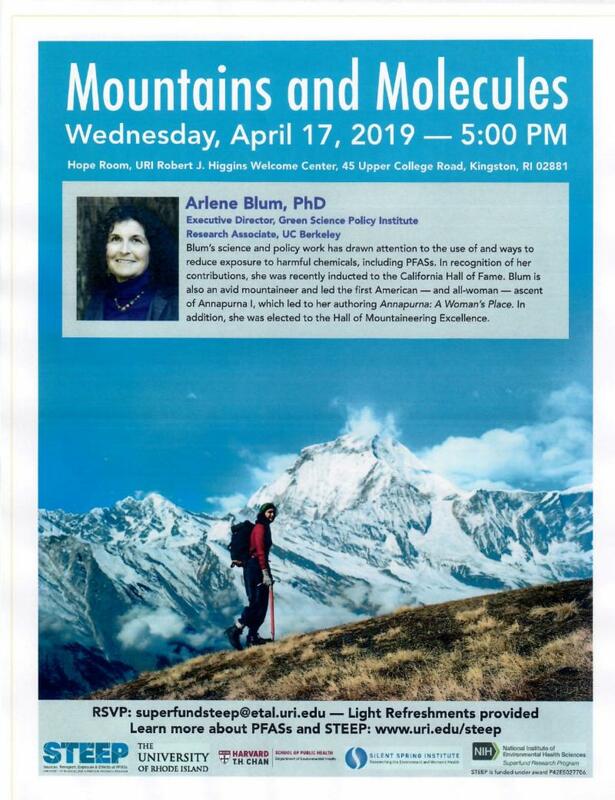 Arlene Blum will giving a lecture about PFAS and other chemicals of concern. Learn more here. Tom Bruton will be giving a keynote and participating in a panel. Learn more here.